When asked how many Russians will be affected by the new US sanctions, Huntsman said that "we’ll have to see how that plays out"
MOSCOW, January 16. /TASS/. 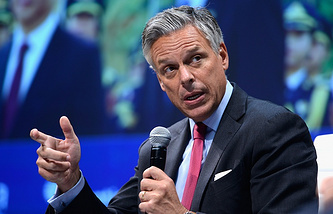 Washington will unveil new sanctions against Moscow on January 29, US Ambassador to Russia Jon Huntsman told TASS on Tuesday, adding that it was too early to say how many Russians would be affected. "We have a January 29 due date," the ambassador said. "People worked very hard on that part of the legislation [the Countering America's Adversaries Through Sanctions Act (CAATSA)]," he added. When asked how many Russians will be affected by the new US sanctions, Huntsman said that "we’ll have to see how that plays out." At the same time, he said that "we’ll have to see, what comes of the work … knowing, that it will impact the short term of our relationship, but also the longer term of our relationship." Russian Deputy Foreign Minister Sergei Ryabkov said earlier that the US administration was expected to present to the Congress two Russia-related reports, which concern the implementation of the CAATSA. According to Ryabkov, "it is another attempt to influence the domestic situation in Russia, particularly ahead of the presidential election."